Who had the first $100 million contract of this young Hot Stove season being signed by a player who wasn't going to hit free agency for FOUR more years. Cliff Lee will sign a deal well north of the $100 million mark. 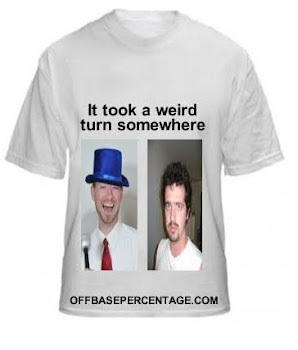 Carl Crawford will probably get nine figures too and Jayson Werth might come close. But it was Troy Tulowitzki who was the first to ink a contract that will provide him the financial flexibility to buy Iceland out of bankruptcy and fill it with dogs wearing sweaters. I dare him to come up with a better use of that money. Tulo's new deal is actually just an extension which picks up his 2014 option for $14 million. The "new money" is the $119 million he will make from 2015 through 2020 or his 30-35 year old seasons. Did the Rox jump the gun on making Tulo the new face of the franchise for the next decade? Yeah, probably. Tulo is coming off of his best season posting a 6.4 WAR despite only playing in 122 games. He also missed 61 games in his 2008 campaign. So, the Rockies are gambling that Tulo won't be gimpy every other season. Maybe he can buy one of those hyperbaric chambers with his riches. Tulowitzki has been a blog favorite around these parts and solidified that position with his 15 homer, 40 RBI, .303/.366/.754 line September which helped him garner a 5th place finish in the NL MVP voting. 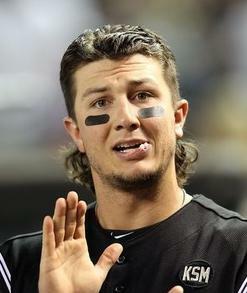 I wasn't as appalled by the deal as some of the other baseball scribes but maybe I'm biased because Tulo rocks a sweet mullet. I'm no scientist, unless you count mixology, so I'll leave the heavy lifting to the math nerds amongst us. The great Tangotiger ran the metrics and figures Tulo will be worth almost the exact amount of cash he's due. So there, Jeff Passan. Of course, the awesome fallout from this signing is when Derek Jeter holds firm for a 6-year, $2.3 billion contract. What? Minka Kelly totally deserves her own island.